The fabulous new nail polish collection for the fall 2018 season from Chanel has arrived! 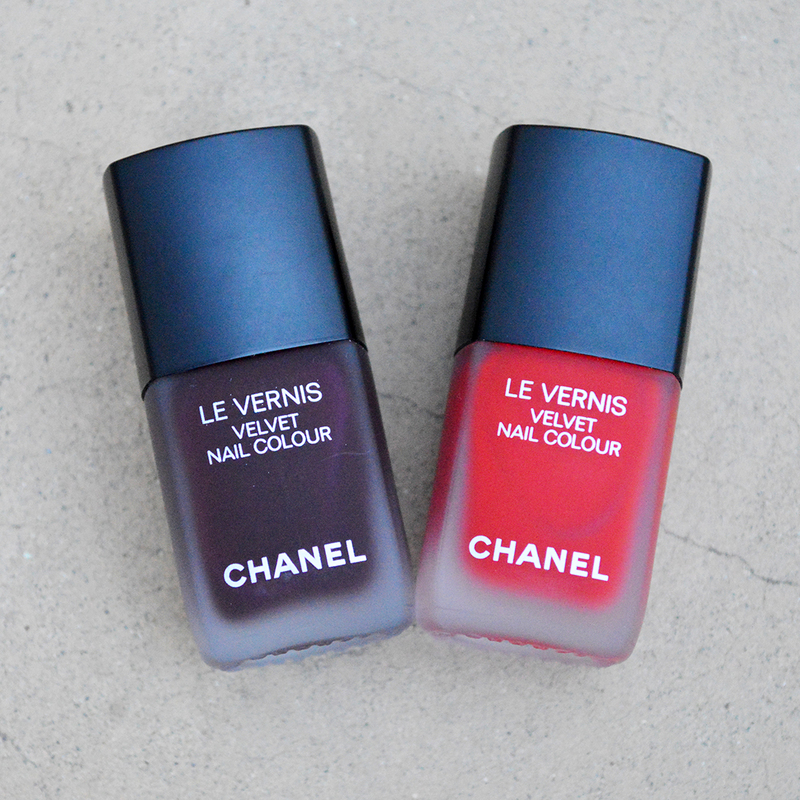 “Le Mat de Chanel” is an autumn beauty collection filled with shades of deep dark burgundy and classic red; all matte. There is nothing shiny, sparkly, or glittery about Chanel’s fall 2018 make-up collection. It is dark, autumnal, serious, and very matte. Instead of three or four nail polish hues for the fall season, as Chanel normally puts out for a big season, there are two colors. 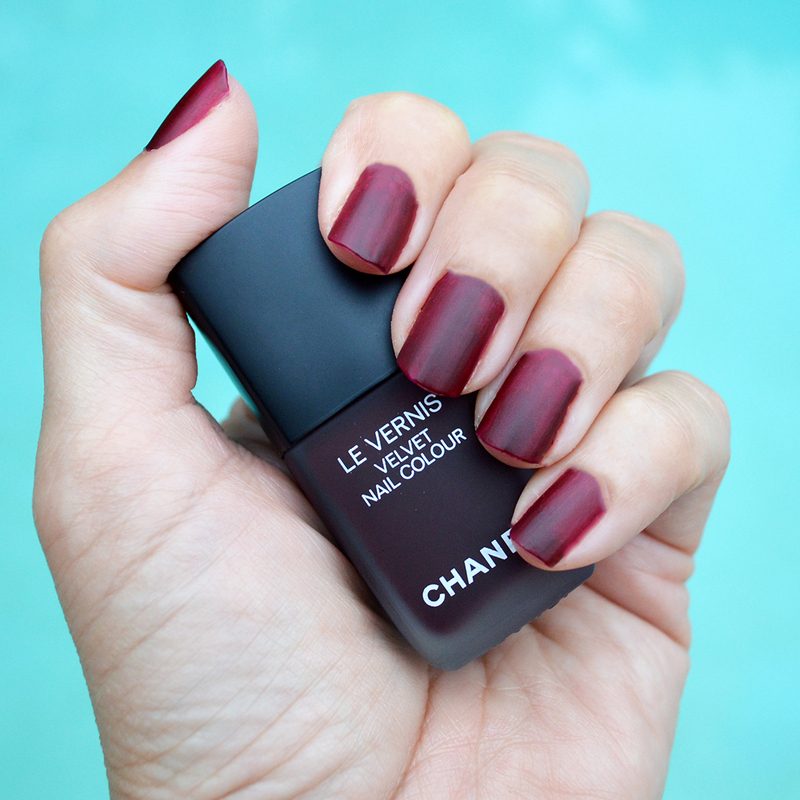 Chanel Profondeur is a deep, burgundy hue which is vampy and quite fall-like. 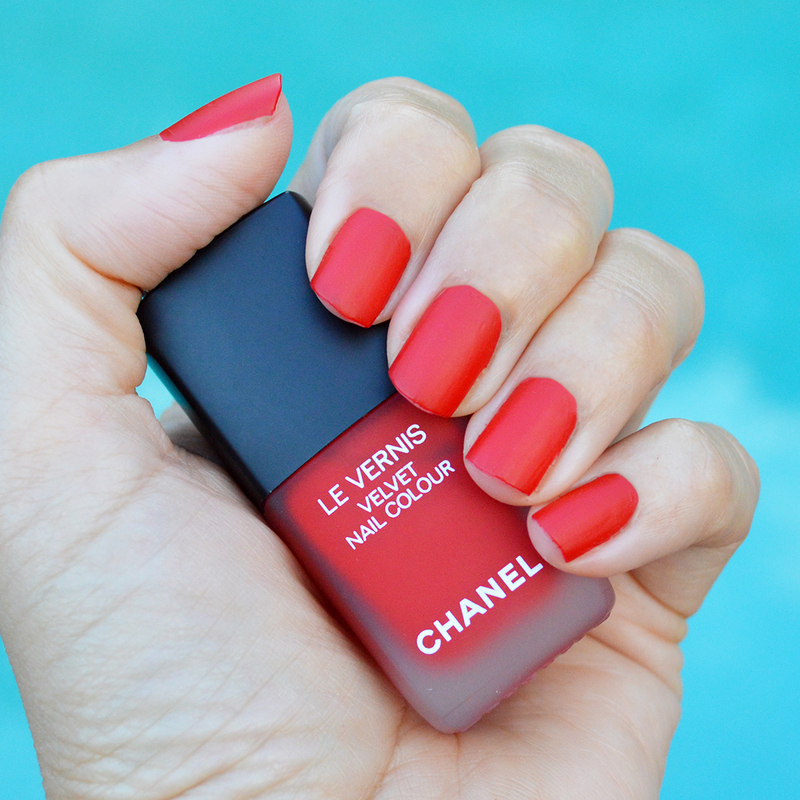 Chanel Ultime is a traditional classic red hue with a twist. The matte finish makes it an understated and very serious red. I love these two colors! For the fall 2018 season, we are seeing a more traditional autumn color palette. Colors are darker, more understated, and offer a 1970s vintage vibe. The two new nail polish colors from the Chanel “Le Mat de Chanel” fall 2018 beauty collection fit right into what we will be seeing on store shelves for the upcoming cool weather season. This makes both colors easy to wear as we transition from summer into fall; especially Chanel Ultime nail polish since it is a classic red hue with a matte finish. This is a color that can easily be worn now, and as we move into the fall season. Chanel Ultime velvet nail polish for fall 2018 is a medium red hue which appear to be a classic scarlet color when first applied. As the nail polish dries, the matte finish appears which gives nails a softer yet vibrant red hue. 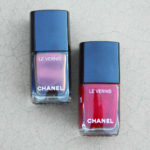 I normally shy away from red nail polishes, but Chanel Ultime’s matte finish makes this an easy red nail polish to wear. I don’t feel like my nails are flashy with Ultime, the matte finish gives them a surprisingly understated look. Love that! 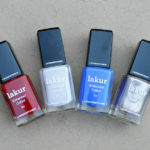 In order to test out Chanel Ultime nail polish, I used one base coat and two coats of color. The nail polish went on smoothly, and evenly, in two coats. It did not streak or leave bubbles. This was an easy application! As with other Chanel nail polish hues, Ultime by Chanel is chip resistant and long lasting. I mentioned earlier that this color will be great to wear as we move from summer into fall. Well, I meant it! Since Chanel Ultime is a classic red hue, it can be worn with our current wardrobes as well as into the fall season. In fact, it is such a timeless hue that Ultime by Chanel could easily be worn during all four seasons. Love! I wanted Chanel Profondeur to be my favorite of the two autumn hues, but it leaves streaks when applied. In the photo above, you can see it with one base coat and two coats of color. In order to get a solid application, Chanel Profondeur needs three coats. Aside from the extra step in application, this is a really nail polish hues. The matte finish offers a little edgy vibe to the otherwise classic fall color. Chanel Ultime and Chanel Profondeur are both fabulous nail polish colors which will easily carry us through the fall season. The matte finish gives both of them a fresh and unique look for the autumn season; plus there is something understated yet edgy about matte. Such a contradiction-but so true! Which of the two fall colors are your favorite? The Chanel fall 2018 nail polish collection is joined by an eye shadow quad featuring shades of brown, and matte lip crayons. You can find the Chanel fall 2018 “Le Mat de Chanel” beauty collection online here. Oooh yes that red color is calling my name. So pretty! I haven’t worn matte before so this is new for me. Good to know that it applies on smoothly! I have never tried Chanel nail polish, but I am so loving the colors the you shared! Bummed that the Profendeur leaves streaks! It’s such a pretty hue! Thanks for honest review. That red color looks gorgeous for summer! I love the sheen to these. Not glossy, but not quite matte. So beautiful. That bright coral-red shade is such fun for summer and the burgundy will be great in autumn! You always have the best nail polish finds. The burgundy one is more my style, but I think the red looks great on you. I have been wanting to try their nail polish for so long!!!! Thanks for sharing all of this- so excited to try! Love these pretty colors for fall! I feel like this plum is going to be my go-to color! Loving that red! Such a beautiful shade. Oh goodness that plum color is STUNNING! I’m so ready for fall!! I love Chanel nail polish! They have so many great colors and the bottles are so chic! Ooh I love the matte red color- these are perfect for fall!